Colwyn Bay in North Wales is a relic of a bygone age when seaside towns were the fashionable place to go on your annual summer holidays. Modern Colwyn Bay isn’t quite as popular as it was a century ago, but it still has enough charm to attract many thousands of visitors during the summer holiday season, and thanks to its close proximity to the A55, it is only an hour’s drive from Manchester and Liverpool. Colwyn Bay is like many other traditional seaside resorts: it has a long promenade, a pier, and a stretch of golden sand. 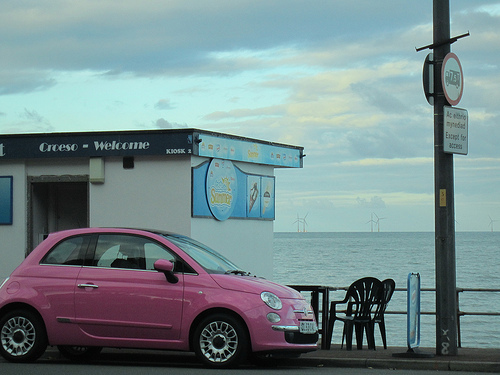 People come to Colwyn Bay to enjoy a bit of fresh sea air and an ice cream as they stroll along the promenade. The town is also a great destination for a fun day out if you are staying further inland in the Snowdonia National Park. Fresh air and fantastic sea views don’t cost a thing in Colwyn Bay. There is plenty of free parking along the coast road, so you can park and then enjoy a pleasant walk into the town centre. The large, man-made stretch of golden sand is always accessible and is the main attraction in this pretty seaside town, even at high tide, so no matter what the weather is doing, you can stroll along the beach, kick a football around, or just sit back and relax for a few hours. The pier is now closed, but there is a nice cycle track along the promenade and a brand new water sports centre next to the beach. The Port Eirias Watersports Centre has lots of great facilities, including jet ski ramps into the water, and kayak and canoe hire. The town is also blessed with a number of very pretty parks, most notably the Eirias Park and Queens Gardens. If you want to watch a play or film while you are in Colwyn Bay, check out what’s on at the Theatre Colwyn—it has a regular programme of films, musicals and dramatic productions. The town centre has the usual selection of shops and pubs, but the local Weatherspoon’s is of note because it was the old Princess Picture House in a previous lifetime. The most famous attraction in Colwyn Bay is the Welsh Mountain Zoo. You can catch a free bus from the railway station in town and take the kids to see the zoo’s animals in their hillside habitats. Llandudno, another famous Victorian seaside resort is only a few miles up the coast. Conway Castle is also close by, and is well worth a visit. Rhos-on-Sea to the north west of Colwyn Bay is the location of the smallest church in Wales: the tiny 6th century chapel of St Trillo’s. For fabulous views, take a walk up Bryn Euryn, a hill overlooking St Trillo’s Church and Rhos-on-Sea. There are the remains of an ancient hill fort at the summit as well as a nature reserve close by. And if you want to travel a bit further away, the Snowdonia National Park is simply stunning.